Cosmetic Ingredient Review（1986）「Final Report on the Safety Assessment of Hydroquinone and Pyrocatechol」International Journal of Toxicology(5)(3),123-165. Cosmetic Ingredient Review（1994）「Addendum to the Final Report on the Safety Assessment of Hydroquinone」International Journal of Toxicology(13)(3),167-230. Cosmetic Ingredient Review（2010）「Final Amended Safety Assessment of Hydroquinone as Used in Cosmetics」International Journal of Toxicology(29)(6),274S-287S. Cosmetic Ingredient Review（2014）「Amended Safety Assessment of Hydroquinone as Used in Cosmetics」Final Amended Report. 山下 邦彦（2016）「惹起相を含む皮膚感作性試験 LLNA：DAE 法の開発」, <https://ynu.repo.nii.ac.jp/?action=repository_action_common_download&item_id=7668&item_no=1&attribute_id=20&file_no=1> 2019年4月9日アクセス. N Tatsumoto, et al（1990）「The effects of ultrasonic irradiation on the chemical reaction of hydroquinone」Journal of the Acoustical Society of Japan(11)(2),63-69. A Palumbo, et al（1991）「Mechanism of inhibition of melanogenesis by hydroquinone.」Biochimica et Biophysica Acta(1073)(1),85-90. 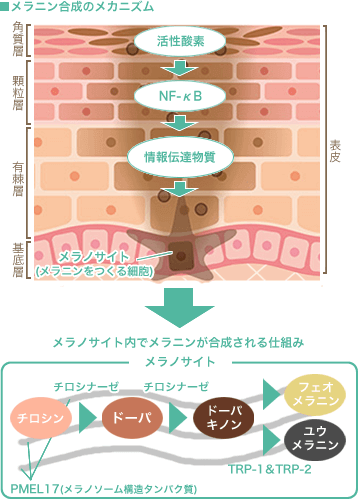 S Parvez, et al（2006）「Survey and mechanism of skin depigmenting and lightening agents.」Phytotherapy Research(20)(11),921-934.